I'm putting myself out on a limb here, predicting the most talked about vehicle at next month's Los Angeles auto show. Forget about hybrids, fuel cells and electric-powered vehicles. Ditto for cars with eight-speed or dual clutch transmissions. As for grilles with electrically powered, movable shutters, well, that technology is so yesterday. The buzz will be about the 2011 Nissan Murano, and here's the attention-getting term: CrossCabriolet. That's two-door convertible, as in first crossover convertible. Yes, this is a production vehicle, not some concept or experiment. It's a bold move by Nissan to draw attention to Murano and hopefully add more than incremental sales. 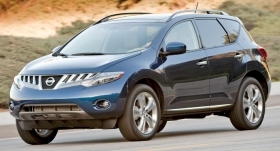 The hurdle for Nissan is that the styling of today's Murano is polarizing. Love it or hate it, the Murano CrossCabioletwill be turning heads. But will it make a dramatic difference in sales?